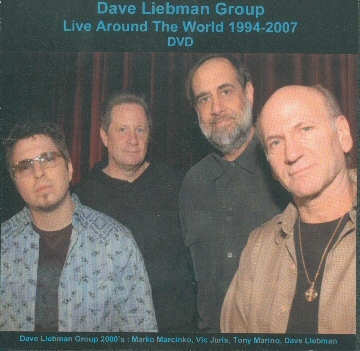 Dave Liebman Group - Live Around The World 1994-2007 [liebmanDVD] : Jazz Record Center, Rare and out-of-print books, records and more. Fetures the Dave Liebman group in performance at the Red Sea Festival, Israel (1994); The Subway, Germany (2000); Chivas Festival, Brazil (2004); IAJE Convention, NYC (2007); and Cota Festival, USA (2006). Features Dave Liebman, Vic Juris, Tony Marino, Marko Marcinko, Phil Markowitz, and Jamey Haddad.